Welcome to the Alpha Phi Chapter Website! We are very delighted to serve our active members and future leaders of the nursing community! Please feel free to explore our website for upcoming events, networking opportunities, and panels for career advancement. Apply Now for Sigma Theta Tau, Alpha Phi Chapter! Students are invited to join STTI through one of the more than 490 chapters located at colleges and universities around the world. Learn how an STTI membership can benefit your nursing career! Thank you for electing me as President of your chapter for a second, two-year term (2018-2020). We have a strong foundation and now we need to turn towards more membership engagement. On behalf of all your Alpha Phi Board Members and Committee Chairs, I am pleased that you have chosen this chapter. STTI is an excellent way to enhance your professional development and explore new opportunities for scholarship and service. Consider involvement not only in chapter activities but also in the International society. We have a number of committees including Community Outreach and Publicity; all of our committees have chairs so you would be able to contribute as a committee member. Make sure that you are accessing all of the benefits of membership in Sigma Theta Tau including the subscription to the Journal of Nursing Scholarship which is part of your membership dues. I have been struck with how there is a growing consensus about nursing science and, as Sigma Theta Tau members, we are shaping that paradigm internationally. The Alpha Phi Chapter is an engaged and energetic chapter with many opportunities for members to be actively involved. We currently offer a number of special recognition activities for our active (dues paying) members; specifically the Creative and Scholarly Project award to a member graduating from one of the academic programs; two $1,000 evidence-base practice awards; and a research grant with $2,000 of funding for an IRB approved study. We jointly sponsor the research day at Graduate Center where you can present your work and learn more about the PhD program. Since the majority of our members have been working as registered professional nurses for less than 5 years, we offer a panel twice yearly for new graduates to address workplace issues and continuing education. These panels are scheduled before the Fall social and the Spring business meeting. Our web site has posted details. Our work is supported by your dues of which we receive $35.00 and the chapter is financially sound. Sigma has decided that they will no longer accept donations to the chapter when you renew your membership but we appreciate your past support. The laws regulating fund raising in New York State have resulted in the Board deciding that we will rely on dues as our only source of income. We will celebrate our 50th anniversary in 2020 – some of the original members have already said that they would assist in the planning. Hopefully this will be an inspiration for some of our newer members to renew their commitment to Sigma and nursing excellence. Please feel free to contact me, or any member of the Alpha Phi Board, with any questions, concerns, or ideas you might have. Best way to reach me is kathynokes@aol.com. Our Fall social – which includes the kickoff for the toy drive for Edwin Gould is November 28th, induction is April 10th, and the Spring Business meeting is June 19th. Since weather-related events can happen, please connect with me closer to the date of the event – I welcome hearing from you. We would like to congratulate Fernand A. De Los Reyes, MSN, MA, RN-PMHNBC for being the recipient of the 2018 Research Grant! Join us in our chapter fall social event on November 28th! 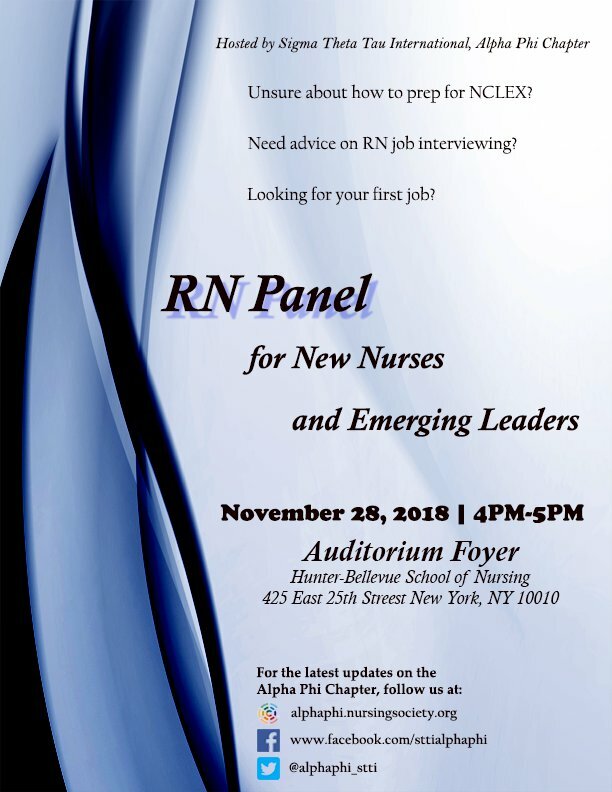 In addition to meeting members of the Alpha Phi chapter, we will be hosting an RN panel, featuring four Hunter-Bellevue alumni who will talk about accomplishments and nursing journey after NCLEX. Please look forward to our leadership conference presentation and our annual toy drive for the Edwin Gould Foster Care Agency! On September 19, Governor Andrew M. Cuomo announced a $3 million grant supporting research and education projects focused on breast cancer prevention and treatment. Jin Young Seo's project on breast cancer education programs tailored to Korean immigrant women population was among the nine projects that was announced that day. This breakthrough research will establish "The Korean Breast Cancer Risk Reduction Program," a cultural-based education program promoting healthy lifestyle and regular health screening, addressing health disparities among the Korean immigrant community. Congratulations to Jin Young on your accomplishments. The Region 14 Biennial meeting was held June 3rd 2018 in Neptune, NJ. The Alpha Phi Board had voted to support the meeting with a $400 donation which entitled us to 6 free registrations. Since the distance from NYC was considerable and the conference started at 8 AM, the Board also voted to provide active members with up to a $240 travel grant. News of the grant was circulated on the web site and 5 active members indicated their interest in attending and were supported: Amil Tan, Manuel Co, Jr, Po Chan, Dorothy Hickey, and Kathy Nokes (who only took free registration – no grant). The chapter was well represented: Manual Co Jr gave a podium presentation entitled Relationship between perceived healthy food access among urban Hispanics; Kathy Nokes (co-authors: Marge Reilly and Kathy Falk) presented Creative Connections: Facilitating access for Sigma membership and immediate Past President, Nancy Bohnzrczyk presented a poster entitled: Developing, implementing and evaluating a long term care residency model. 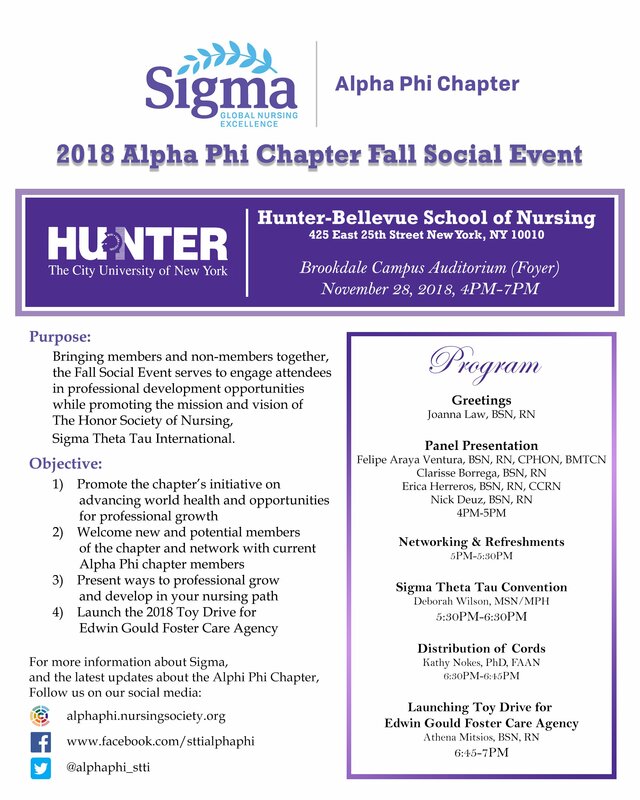 Due to the inclement weather at the end of March, CUNY Hunter-Bellevue School of Nursing was closed on the day of the 2018 Sigma Alpha Phi Chapter Induction Ceremony. We express deep regrets as it is important to us that we welcome our newest members and celebrate their accomplishments and success. 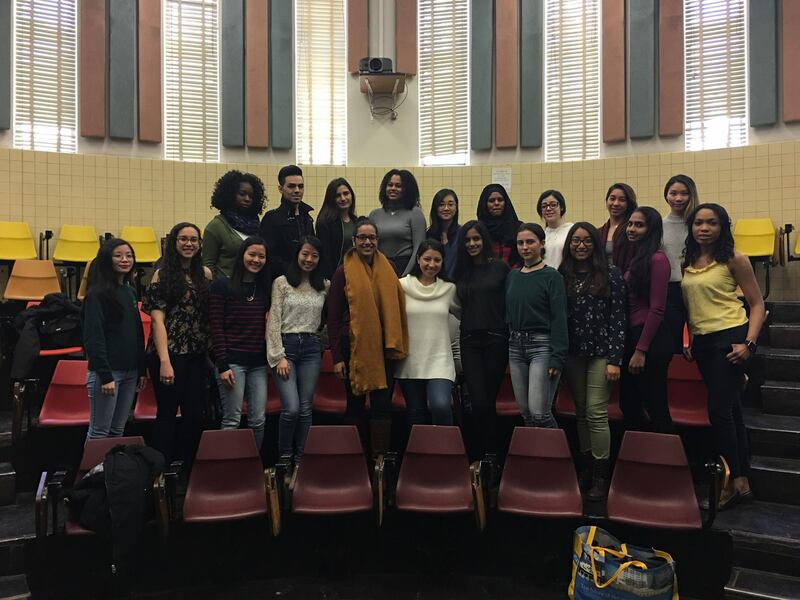 We would like to thank Hunter's undergraduate class for taking these beautiful group pictures. Congratulations and Welcome to the Alpha Phi Chapter of Sigma! 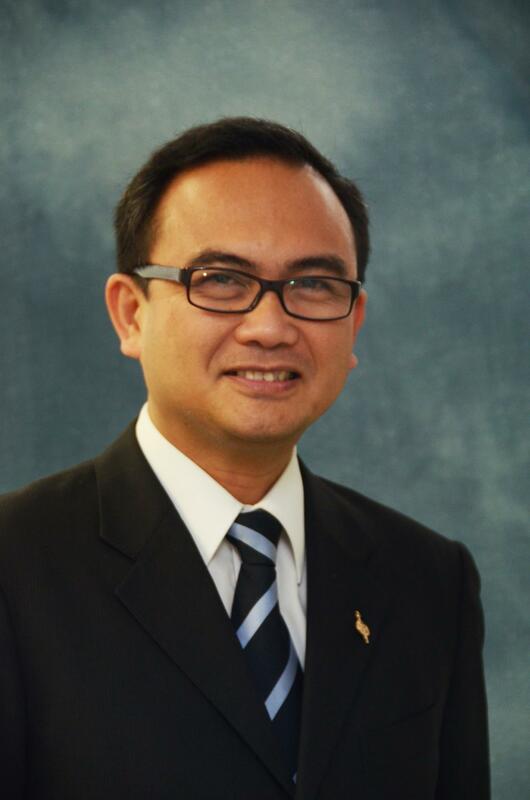 Dr. Nickitas served the chapter for countless years on committees, as President, and most recently, as Faculty Counselor. In recognition of her service to the chapter, we presented Dr. Nickitas the Past President's pin for her dedication and contribution to the ongoing sustainability of the chapter. For many years, the chapter has given a Creative and Scholarly Project Award to students graduating in January and May who are Alpha Phi members. Students can be graduating from any of the five levels of nursing educational programs: Generic Undergraduate; RN to BSN; Accelerated Second Degree; Graduate and Doctor of Nursing Practice. The criteria are that the award is presented to the student or group of students who has developed an outstanding creative or scholarly project significant to nursing or health care in its impact on the target population and its potential usefulness in a clinical setting. There is a possible total of 8 awards annually. Winners receive a certificate along with a check for $100 from the chapter (if there is a group, the total amount is divided among the chapter group members). Faculty nominate candidates but self-nomination is also fine. Blimp Marcus from the DNP program at Hunter College. The project was titled Increasing BRCA Screening for Eligible Orthodox Jewish Ashkenazi Women. Women of Ashkenazi Jewish descent have a tenfold increase in carrying the BRCA mutations, which are associated with a significantly increased likelihood of developing breast cancer, ovarian cancer, and other cancers. 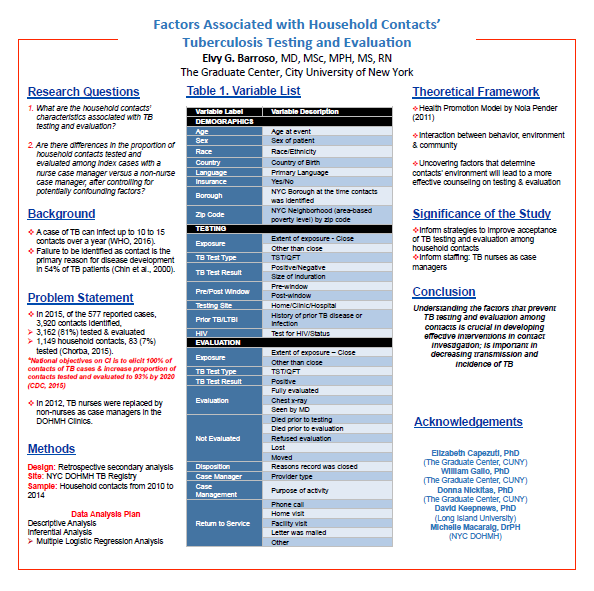 This study used the Health Belief Model (HBM) as a framework to understand women’s fears and health beliefs in a sample of 29 women in an Orthodox Jewish community. Findings from this study may result in appropriate interventions and culturally-sensitive methods to increase uptake of cancer screenings, and improve overall health outcomes in this community. Jana Kozol’s from the RN to BSN program in the School of Professional Studies. The purpose of that project was to enhance nurses’ compliance with hospital patient safety policies. The expected outcomes were improved patient safety practices in comparison with data collected during the pre-intervention period. The room audits should be at 80% and above, thus earning a smiley face (😊) as a final score. XiaoXia Huang from the Undergraduate BSN program at Hunter College. 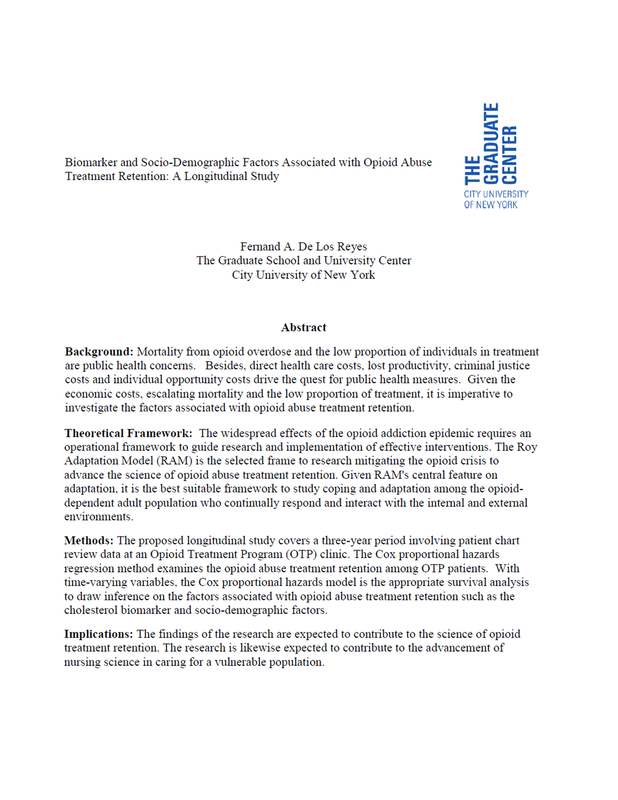 The project, titled Mental Health Service Utilization Among Older Chinese-Americans, analyzed qualitative interviews and data by Chinese-Americans (age 60 and older) on their experience seeking mental health services using the NVivo software. Results from this study shed light on common barriers that hinder the populations’ accessibility to mental health services in hope of improving treatment and service availability to older Chinese-Americans. More than 2500 persons attended the scientific sessions and 1022 delegates participated in the two-day business session. The chapter supported the participation of the President (Kathy Nokes), Vice President (Marge Reilly), Treasurer (Po Chan), and Governance Chairperson (Athena Mitosis). The Flag Processional during the opening plenary showcased the member countries of the international honorary society. The new branding was also revealed. The first three individual leaves on the laurel represent love, courage and honor, the core values of Sigma. The logo has the descriptor of “Global Nursing Excellence." 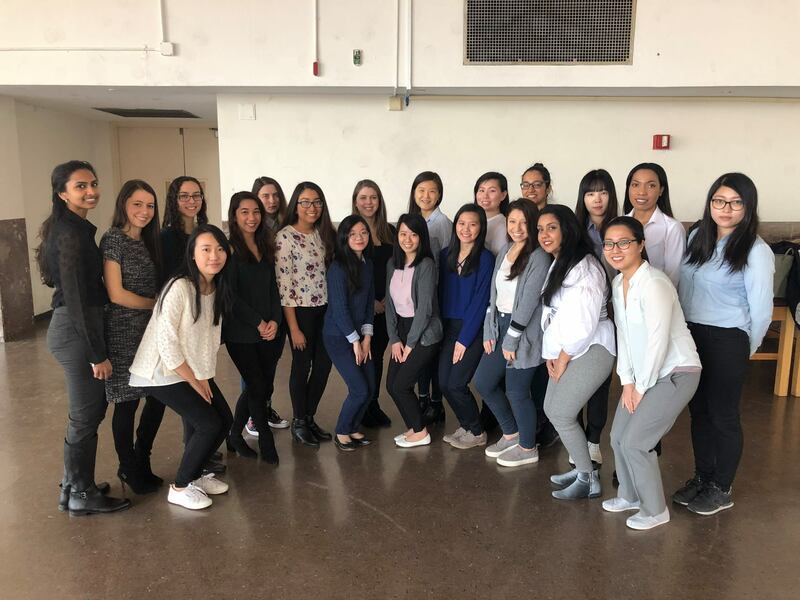 Alpha Phi Former President and Faculty Counselor, Professor Donna Nickitas presented her research on mentorship in a Nursing PhD program and linked the mentor’s qualities and mentees’ successful progression in the program. Mentees with mentors matching their ideal mentor attributes were more likely to graduate sooner. Therese Richmond, recipient of the Episteme laureate, shared her research on psychological recovery from trauma and trauma-informed care. Over a few days, we met with different candidates for office who spoke of their visions for bringing chapters from different countries closer in the future. Results from the work of the Global Advisory Panel on the Future of Nursing & Midwifery (GAPFON) were presented. The report synthesized data on global healthcare challenges gathered at meetings in each of seven global regions. Overall top five priorities were non-communicable diseases including chronic diseases, mental health, communicable diseases, disaster preparedness and responses, and maternal-child health. We closed the day by participating in the Region 14 forum meeting. Dr. Patricia E. Thompson, retiring Executive Director, shared the values that transcend change during the plenary session. We need to focus on values instead of fear. During one of the scientific sessions, Dr. Kathy Nokes, Chapter President, presented her research with Dr. Judith Aponte, former Treasurer, on Hispanic online health literacy. 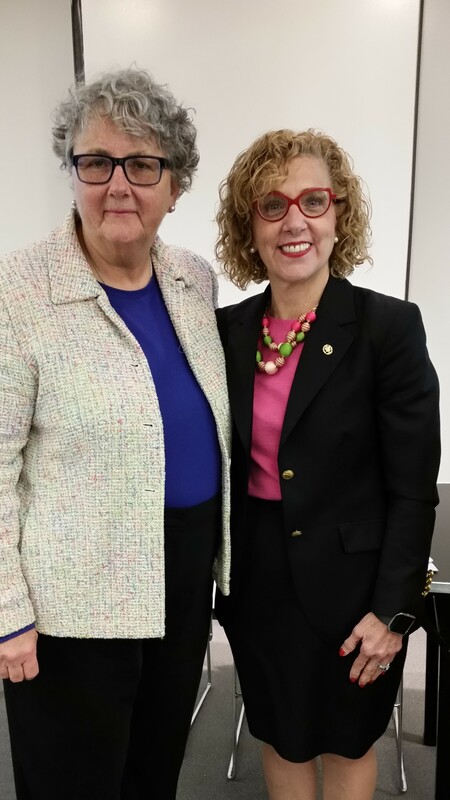 A Farewell Reception was held for Dr. Pat Thompson on the occasion of her retirement as CEO of Sigma. Heartfelt tributes were offered by past presidents Dr Hester Klopper and Dr Carol Huston on her long service and key contributions to the organization. Dr. Elizabeth Madigan has been appointed new CEO for Sigma. There were many opportunities to attend presentations focused on research, clinical, and educational innovations as well as occasions for networking with national and international colleagues. In summary, Kathy, Marge, Po, and Athena would like to thank you for your support to attend this convention. 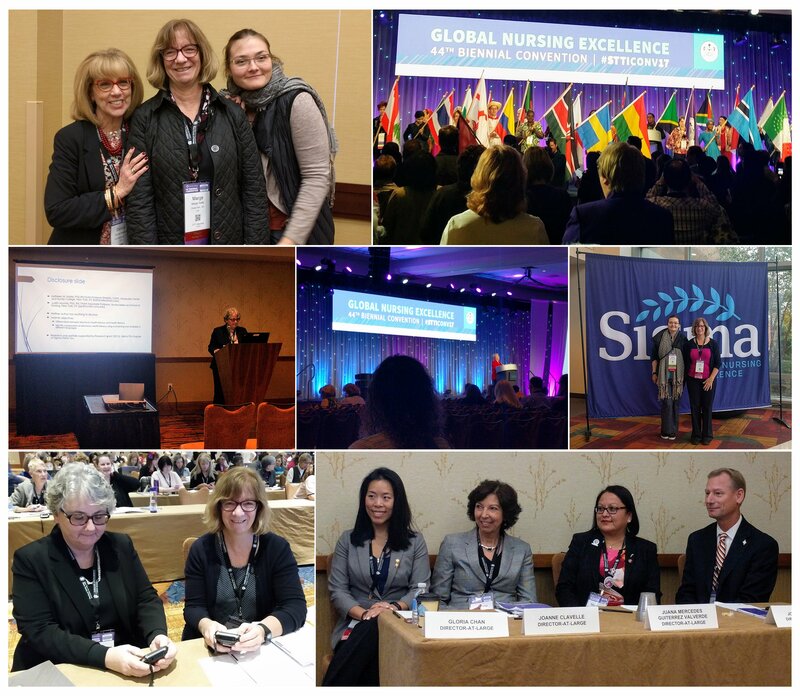 The convention has given the participants opportunity to experience first-hand the core values of Sigma – global nursing excellence in scholarly research and leadership. Po and Athena wanted you to know that, as newly graduate nurses, they thought that it was an amazing experience to see the world’s greatest leaders in nursing all under one roof, expressing their passion and disseminating the latest research from around the world. Please mark your calendar for the 45th Biennial Convention in Washington DC from November 16 through 20th, 2019. We would like to congratulate Elvy G. Barroso, MD, MSc, MPH, MS,RN for being the recipient of the 2017 Research Grant!